Is it feasible to tap into AC plenum for temporary focused AC in FL garage shop. If I could direct my house AC at a 10 sq ft area containing my TS and router table for brief periods that would solve a lot of problems. If yes, how do I do this. Is it cutting a hole into plenum and attaching some AC hose to direct flow where I want it or something more elaborate? 2 things I can think of. You are now drawing air out of the house, creating negative (I think). That will draw more outside hot air into the house and may overwhelm the AC…in terms of keeping the house cool. The second is it might be against code anyway, so it might pay to check….or just ignore the code. But back to the question, doing it the way you described would (probably) get the air flow you want. Totally against code in all 50 states. Don’t do it. High risk of CO2 entering the home. Find another means to condition your space. -- I'm like the farmer's duck. If it don't rain, I'll walk. Nitpick: it’s not CO2 they’re worried about, it’s CO – carbon monoxide. But yes, a bad idea. There are a ton of other ways to condition a garage space. I just retired and I am spending lots of time in the garage / shop. I bought a portable AC and it does make a difference in the heat / humidity and for $500 it’s a low price option. If I had seen this a month or two sooner though this is what I would have done instead. You can get systems that are completely DIY. Chances are this is in my future. Gramps – on your other post, I mentioned that idea and how do it. so there is no fear of carbon monoxide. (IMHO). not be a negative force in the duct to draw CO into the house. the suction is at the air handler in the house – not in the garage. (for that very safety reason). besides – who runs their car in a closed garage anyway ??? John, I saw an article a few weeks back about there being numerous instances of individuals who were poisoned by carbon monoxide after leaving their cars running in the garage. The newer cars with keyless fobs and a push button for starting make this too easy. When you don’t have to retrieve your keys from the car as you exit you can be distracted and leave it running. enter the house through an A/C duct in the garage if it is pressurized ?? I just made a pencil sketch for Gramps for his review of what I am going to do to my garage. are not in the garage. if anyone would like to see the sketch, PM me with your email and I will send it to you. I will not post it here because of possible negative ramifications. prohibits the additional duct to cool a residential garage space. so the statement of: “Totally against code in all 50 states” is not a correct statement !!!!. and not correct in your neck of the woods. (YMMV). [This is my last comment on this subject]. When I was in kindergarten my friend died in his garage when his grandmother left the car running. It happens. Not a good idea. An A/C system, in order to work efficiently has to be balanced room to room within the house. Tapping off the house A/C to feed the garage, will through the balance way off. Remember if you divert air to the garage, there has to be an air return to achieve balance. 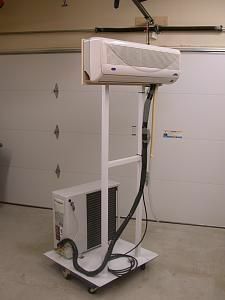 If the house has been properly sized for an A/C system, you may not have enough BTU’s for the garage to share. I speak from experience. I had ductwork extended to a large room that was formerly a garage. When I did, my A/C system couldn’t keep up with the added load. It ran continuously (not good), so I had to upgrade the A/C for a bigger unit. The issue isn’t that bad stuff (CO etc.) is going to come back through the duct that is blowing air into the garage, its that the garage will be at positive pressure and the house at negative. So air from the garage will be getting back into the house through whatever means it can. Certainly any door seal, but also things like power outlets, and any sort of crack. Attic is also a common way it would. And attic air is usually pretty bad stuff, lot’s of dust, pollen, possible fiberglass fibers. Maybe even stuff from bird and bat excrement. 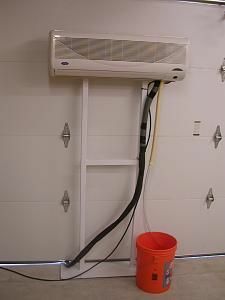 Also, when the AC unit is off, air can actually go backwards through the duct if the garage became pressurized relative to the rest of the house. This can happen if you have wind creating pressure differentials. Since we are talking using the garage space for a wood shop, you would also be encouraging fine dust to migrate from the garage shop into your house. Fine dust is a health hazard. Another issue is if the house has gas appliances like a water heater or cloths dryer. If this is in the negative pressure area of the house, it could draw combustion products like CO2 and I supposes some CO back into the house by making the air flow in the flue go backwards. To avoid this you would have to vent the garage to the outside world so it doesn’t become pressurized, and in turn open the house up to the outside so it doesn’t become negatively pressurized. This of course would be very inefficient for AC. But would avoid the problem. This in fact is effectively what I used to do in my old house. But that used an evaporative cooler, a form of displacement cooling, and those require you to vent the air to the outside. I would just close up the house and open the garage door to the house, and crack the main garage door. But, of course evaporative coolers aren’t the thing to use in humid places like Florida. Not a good idea. An A/C system, in order to work efficiently has to be balanced room to room within the house. Tapping off the house A/C to feed the garage, will through the balance way off. Remember if you divert air to the garage, there has to be an air return to achieve balance. If the house has been properly sized for an A/C system, you may not have enough BTU s for the garage to share. I speak from experience. I had ductwork extended to a large room that was formerly a garage. When I did, my A/C system couldn t keep up with the added load. It ran continuously (not good), so I had to upgrade the A/C for a bigger unit. You are spot on correct, IMHO. In my former life as an organic chemist in the pharmaceutical industry I was heavily involved in the design, construction, and validation of laboratory facilities where air handling was a huge concern (lest we poison ourselves with our own noxious chemicals!!!). Balancing the air supply with the draw of the exhaust hoods is an art and we paid dearly for experts to design and implement the system with sophisticated control systems. Seemingly minor concerns such as what happens when the door to the hallway is opened have a huge impact on how the air flows. A dead end run to the garage seems unwise. As you pointed out, that air has to come from somewhere back at the house and the system was not designed for it. If you put in a return, then all of the vapors from the shop will be distributed throughout the entire house. I understand that such a set up would not be in continuous use, but that only exacerbates the problem. When you shut down the garage, then the house is unbalanced. Even lacking a return from the shop that could contaminate the house air, there could well be a problem. The AC system is not on constantly and there is not always a positive pressure in the duct work. The air can flow both ways. Open a window in the house and you create a path for the air flow to reverse from shop to the house. Whether it is car exhaust, finishing fumes, or those nasty bottles of left over weed killer, I don’t want to be breathing that stuff in my house if I can help it. I do not have the luxury of a dedicated out building for a shop and I know all too well the limitations that the problems of fumes, especially from finishing, can impose on my hobby. I used to love Deft, but gave up on it because although I could apply it with a respirator and try to exhaust the fumes outdoors with fans, the smell always made its way upstairs. I agree that AC units should be matched to the load and arbitrarily adding air conditioned space can be an issue. But if your AC was running continuously, that is good, if it was keeping it cool enough. 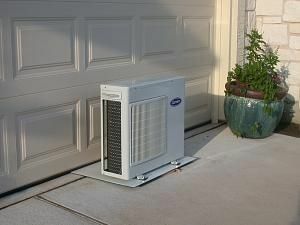 The ideal AC sizing is if the AC unit is runnign continuously during the hottest hours of the hottest days. AC units are a lot like cars. Best millage is a small engine running at a steady rate. Rather than a large engine stopping and starting frequently (short cycling). Most AC systems tend to be way oversized because they don’t put the time in to properly calculate the heating and cooling load. Most often they just use rule of thumb values based on square footage and this is much too simplistic. They just make sure to put in a system that they know is large enough. My house should have about 3 Tons of AC, instead it was built with two 5 Ton units (10 Tons total). Way overkill and extremely inefficient. This type of thing is not unusual. And it’s not all just about cooling. Short cycling makes a house uncomfortable in humid areas. It’s the classic cold yet clammy feeling. The unit is so large it cools the house quickly then shuts off. But it’s on so short a time, the air doesn’t get dehumidified. Other than all the CO discussion, it is not a good idea. Even if your AC unit is oversized and could handle the increased load, there will be an increase in latent cooling (condensing water). Home AC systems are closed systems except for whatever leakage factor a particular house has. The leakage into the house from outside is the make up air system. For every cfm into the garage, an additional hot humid cfm leaks into the house (which is a lot of load in FL). Not only must the air and water vapor be cooled, a lot of that water vapor will be condensed. This creates more water to drain. Remember the increased negative pressure? By creating more negative pressure in the house, water will not drain as quickly because of the negative head inside the house, and can stop the water draining if high enough. The water overflows the drain pan and you can guess the rest. I have direct experience where this type of situation existed. The solution in each case was to return the AC to a closed system. I would not recommend doing it even temporarily for a week or 2. There are several ways as have been mentioned. I worked in the shipbuilding industry and air conditioning on ships required careful heating and cooling loads calculated for each and every compartment on a ship. Everything had to balance out to be considered to spec. It gets pretty hot out on the ocean with the sun beating down on a steel ship. Insulation, heating and A/C is of prime importance in a ship. If A/C contractors would apply the standards used onboard ships to home installation, our homes would be much more comfortable and economical to operate; yet people skimp on one of the most important parts of home construction. A house is rarely “air tight”. There will always be cracks where air can infiltrate. On a ship, there are NO cracks or unwanted openings. A ship is a completely closed system, where the amount of air in equals the amount of air out; in other words, perfect balance. Sorry for the overlong explanation. I speak from experience.